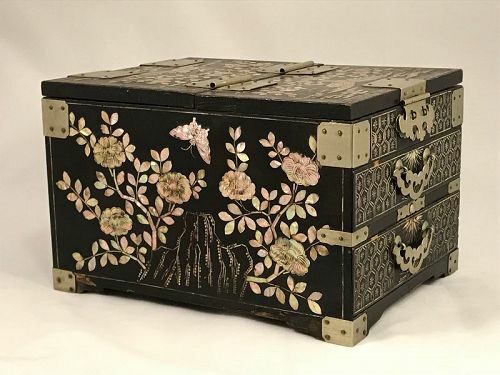 A late Joseon dynasty mother of pearl inlaid black lacquer cosmetic and mirror box of drawers. Cranes and peaches decoration on the top. Butterflies, flowers and rockery decoration on the sides. Bamboo decoration on the back. Honeycomb pattern decoration on the front. Good condition, retaining the mirror, and with only light mother of pearl and lacquer loss. A recent owner lined the bottom of the hinged top mirror compartment with a drawer liner and felt. 19th century. 11 inches long, by 8.5 inches wide, by 7 inches high.